CASTON is a pleasantly attractive agricultural village some eighteen miles west south west of Norwich. The centre of the village is its green which is surrounded by a delightful group of buildings including the school, the Red Lion public house and, on a knoll of slightly higher ground, the Church of the Holy Cross. 47 & 48 Edward III [1373-5] Thomas Caus of Houkham and Henry de Pakenham v Kath widow of John de Caston, Knight, of [concerning] the Manor of Rokeloundtoftes called Kirkehall. ... in 1218 Peter de Nerford settled the advowson on Rob de Katestone. Furthermore, as the list of Rectors begins in 1305 and as the two small north chancel windows appear to date from about 1300, it seems likely that the chancel formed a new church built in about 1300 and that Sir John added the nave. The present building consists of a nave, chancel, western tower and north porch (since 1839 a clergy vestry), all built in flint with stone quoins and dressings. As mentioned above, the chancel seems to date from about 1300. The tower dates from the Decorated period, and the present nave windows are of the Perpendicular period; it is thought that the blocked-up window in the north wall of the nave might indicate the dimensions of the earlier, probably Decorated, windows. The north porch is in Perpendicular style, and bears in its northern gable a cross, below which there is a niche for a saint. The figure is now missing. Above the porch is a parvis, or priest's room. Opposite, in the south wall, a doorway has been blocked up (Martin wrote in 1750 of "a leaded and decayed porch on ye south side", [Rye Manuscripts 17]), but the church does possess a south door in the chancel. Also on the south side, a nave buttress displays a badly worn scratch dial. The tower is at the western end of the nave. Its ground floor forms the porch and is the main entrance of the church. A spiral staircase leads from the south western corner of the porch to the ringing room on the first floor, the clock-room on the second floor, and the belfry on the third floor. From the west porch steps lead down to the nave. This, together with the abrupt termination of the parvis steps at about two feet from floor level, and the fact that steps lead down also from the north porch to the nave, have led to speculation as to whether the nave floor was once at a higher level. 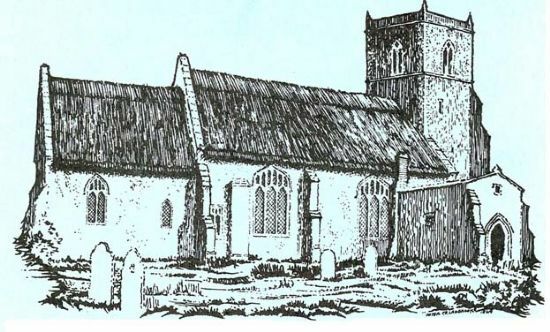 The glorious feature of the church is its fine roof, thatched in 1973 by Mr. Albert D.
Mindham of nearby Merton, with reed from the Norfolk Broads. The work cost £4,657, inclusive of architects' fees and preparatory work by Messrs. W. S. Lusher of Norwich. Originally the building was thatched, as it was at the time of the early nineteenth century print, but in 1852/3 the thatch was replaced by slates. The effect externally was to lower the roof. The principal farmers lent their horses and waggons to fetch the slates from Attleborough station and in the course of a return journey on 9th July 1853 John Anderson, aged 24, slipped from his perch on the shafts and was killed as the loaded waggon was drawn over him. His gravestone in the churchyard bears a quotation from 1 Samuel 20, verse 3: "There is but a step between me and death". It is difficult to be precise, but the cost of the 1852/3 re-roofing appears to have been £335.13s.10d. The missing Churchwardens' Accounts would have shed light upon this. "This beautiful canted roof is all original except for two of three of the bosses; it is of the trussed rafter kind, so common in the fourteenth century. At what time this roof was panelled is doubtful-it may be as old as the roof. On the other hand, this panelling was often added to old trussed rafter roofs, down to late in the Perpendicular period". It is generally thought that the chestnut boarding or panelling, the ribs and the bosses, date from the fifteenth century, save for a few replacement boards, and that the paint on the ribs and bosses is the original fifteenth century paint. The frieze is of more recent decoration. In the 1950s when the electric lighting was augmented and different types of fitting were under consideration, Gilbert Thurlow, then of the Bishop's Advisory Committee, expressed the opinion that it would be quite wrong to hang anything from the roof, and wrong to have men working above it. In November 1940 considerable damage was caused to the glass on the south of the church by the two land mines which fell at Stow Bedon, one mile to the south. Repairs were carried out in stages between 1955 and 1964 by Mr. G. King of Norwich, who incorporated various fragments of old stained glass. Included is a panel which appears to represent the Adoration of the Magi, with the words Ave Maria gracia plena ["Hail Mary full of grace"] above and below it. Prior to the war damage there was also a Katherine wheel of which the "ST K" remains. On either side of the east end of the nave are square-headed windows and the unsupported capital on the south side window probably had a column beneath it. Both windows may have been connected with the former rood loft, for its stairs passed over the north window, the loft itself being probably slightly west of the screen which it would have overhung. There was once an altar in the southeast corner of the nave; the piscina, the stone basin with a drain used for carrying away water used in rinsing the Holy Com¬munion chalice, remains in the wall. The doorway, with its Gothic arch, leading from the clergy vestry to the nave shows the size of the original means of entry for ordinary folk. Probably the great western doorway was used on ceremonial occasions only. The present seating dates in the main from 1839. Fortunately, however, some of the older, possibly 16th century, pews with their delightful poppyheads still remain at the northwest end of the nave. In 1945 their counterparts on the south side were removed to make way for the organ and placed one by the font and another to the east of the organ. In addition there are eighteen other fairly old bench ends with quaint elbow pieces. Kent describes these as being "especially note¬worthy". 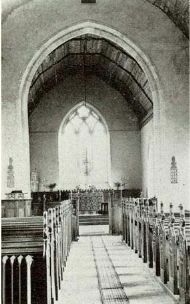 Originally the nave had no pews and beneath the present pews must be the original brick floor and, perhaps, memorials. Running east-west along the north wall, and close to the clergy vestry, there used to be a high pew on the level of the Vestry floor which was used by the Murfet family of Caston Hall. Opposite this on the south side were stepped pews where is now the choir vestry, and which were used by the Banham family. The Rev. W. E. C. Partridge re¬moved these when he placed the American organ there. The pulpit is Stuart and may have been part of a three-decker structure. Prior to its removal by the Rev. W. E. C. Partridge from the south side of the nave to the north side in 1924, it stood two or three feet higher than at present, and was approached by a flight of steps, as at Griston. The handrail of these was cut into sections and mounted on a leather thong, now in the Vestry and used at one time as a "barrier" across the base of the screen under the chancel arch. To make room for the pulpit to be placed in its new position, two or three pews were removed, for they reached almost to the screen. Mr. Ambrose Smith of Caston made the prayer desk from the wood of these pews. The churchwardens' staves were purchased in 1955 with a legacy from Mr. Melville Peeke-Vout. Now used for ceremonial purposes, they have their origin in the days when the churchwardens, important men in the village, held them for protection and for peace-keeping. The present organ was purchased from Bramerton (possibly from Bramerton Hall) in 1945 or 1946. A two-manual instrument with straight (as opposed to concave) pedal board, it was built by Wm. Hill & Son and Norman and Beard Ltd. Prior to 1946 the church used an American organ, in which the organist pedalled air into the pipes. This was purchased by subscription in 1886 from William Lea of Liverpool, the price being reduced from £48 to £34 for cash payment. The second item on the subscription list is "Sale of barrel organ, £5". This latter instrument, capable of producing a limited number of hymn tunes at the turn of a handle, must have been the one given by the Rev. Augustus Sutton, Rector of West Tofts, Norfolk, to the Rev. Walter J. Partridge in about 1854, and in turn presented by him to the church. There is no evidence of a Church orchestra or a minstrels' gallery at Caston and prior to 1854 hymn singing was probably unaccompanied. "there is an ancient inarched monument of the founder (probably one of the Cas tons) in the north wall of the church". Thus it seems that although the space in the alcove was left for Sir John's tomb, he was not in fact buried there, although at one time it contained a memorial to him. Entry to the parvis or priest's room is gained by the door in the extreme western end of the north wall of the nave, from whence a flight of spiral steps leads directly into the room itself, the door and door posts having been removed. Kent attributes the brick stairs to the sixteenth century. The original roof is of interest, its moulded beams now propped up to prevent their falling in. The floor is made of the original thick planks. The room now contains the water tank of the central heating system and some junk, but its original purpose gives us a picture of a priest kneeling in prayer, or sitting in meditation prior to taking a service, or perhaps asleep in the lodging provided for him. It is possible that the Rector once lived in the church building. Or perhaps the parish was once served by a community of priests from, say, Old Buckenham or Thompson, one of whom set out on horseback on a Friday to take services at Caston and Griston and returned to headquarters on the Monday, having lived meanwhile in the parvis. (Caston was connected with Griston two miles to the north-west through the de Caston family, and Griston with Old Buckenham. whose Priory had a cell of priests, through the de Clifton family. A carved stone which the de Cliftons sent to Griston now forms part of a seat in the church porch there). 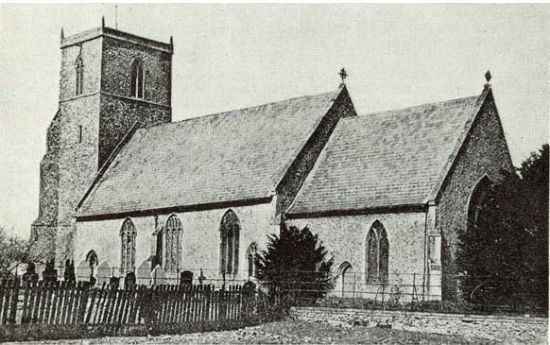 Bryant recorded in "Norfolk Churches" (1898) that the parvis was "used by the churchwardens etc." for parish meetings. Conditions must have been somewhat cramped or the meetings poorly attended. There is reputed to be an underground passage from the church, perhaps from the parvis, to the base of the fifteenth century cross on the Green (or, some say, to Church Farm), but no trace of this has ever been found. Such 'passages' usually prove to be drains, but the discovery some years ago of part of such a passage at College Farm, Thompson, the entrance to which was seen by my father, lends credibility to the Caston story. In memory of / Henry Dover Esqre / who for 21 years resided / in this Parish / the Inhabitants of which / are much indebted to / his liberality; / one instance of which is / an Endowment of the School/to the amount of / £30 a year. / He died at Brighton / on the 4th September 1855 / aged 66 years. A man of some substance, Henry Dover married Louisa, daughter of Henry Samuel Partridge of Hockham Hall, Lord of the Manor of Great Hockham. According to White's "Directory of Norfolk, 1845" Dover was living at the Parsonage, the present Old Rectory. There are three memorials in the chancel floor, all of them on the north side, in black marble, and to the memory of the Twells family, the Rev. John Twells being Rector of Caston from 1768-1803. Sacred / To the Memory of / the Revd EDWd TWELLS / who died Nov. 15th 1801/ in the 26th Year / of his Age. Had the Rev. Edward Twells not died at such an early age, one can but speculate upon what might have happened had he been appointed to the living on his father's death in January 1803. Of his successors, the Rev. Benjamin Barker might well never have built the school, the Partridge family might never have obtained the gift of the living and established their estate in the village, and indeed the whole of the subsequent history of the village might well have been quite different from what has transpired. The altar cross and candlesticks together with the triple-branched candlesticks flanking the altar on either side were probably presented by the Partridge family, while the altar vases were presented by the late Mrs. Dorothy Morfoot of Flaxmoor in memory of her mother. One of these has inscribed on its base the words HOLY CROSS, CASTON / IN LOVING MEMORY OF / MARTHA ANN GUNSON / JULY 1958. The wooden stands for candles, positioned just west of the altar, were made by Mr. C. E. G. Banham. There is in store a smaller, twisted, wooden pair which were obtained by Canon King.